This performance is reenactment of the Seven Years Living Art,1984-91, by Linda Montano, which presented in The Site a Live exhibition, in Diego Rivera Gallery at San Francisco Art Institute. Montano limited herself to wear one color based on chakra for the entire year for seven years. I did the same performance only for a week. Because of the fact that seven is an important and significant number in my religion, Islam. For instance, seven times around the kaaba. 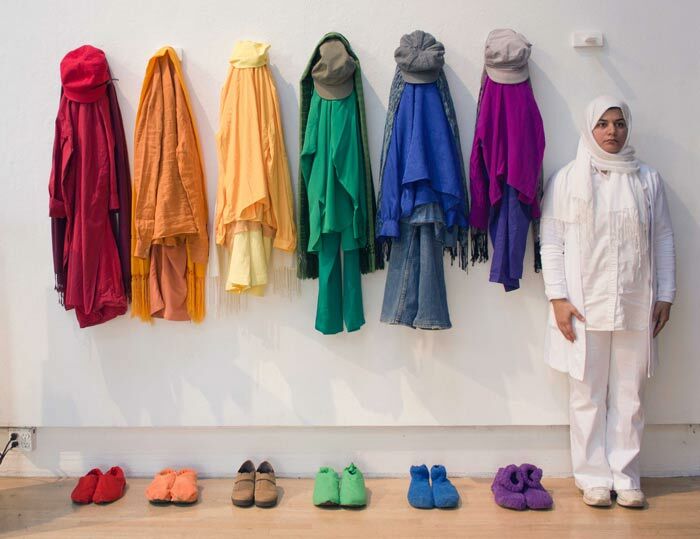 While I was wearing one color every single day, which was a ritual for me, I standstill inside the gallery during the exhibition as life art, then, I documented a second of the performance and presented as a short video.This performance also references the rainbow flag to combine and challenge the complexity between religion and freedom.